It’s the middle of summer, which means nothing sounds nicer than to quench your thirst with a cool, refreshing drink. 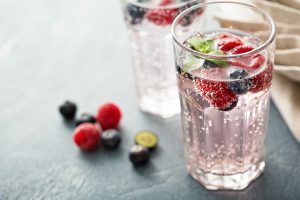 In order to avoid the excess sugar of sodas and enjoy something a little more interesting than plain water, you’ve started drinking sparkling water. It comes in all kinds of flavors, and it’s much healthier for your teeth, right? In truth, any carbonated drink (water or otherwise) actually has a higher level of acid, so is sparkling water really a safe choice for your teeth? A dentist lets you know whether or not drinks like LaCroix are a better choice for your dental health. Can Sparkling Water Harm My Teeth? According to the latest research, sparkling water is pretty much fine for your teeth. There are multiple studies that have tested how sparkling water and regular water affect enamel, and the results are basically the same. Even though carbonated drinks have more acid in them like we touched on above, this thankfully hasn’t shown to lead to more tooth decay. While plain sparkling water is safer for your teeth compared to other beverages that can be packed with sugar (sodas, juices, etc. ), it’s still a good idea to drink plenty of water that comes out of your tap because it contains fluoride. Regular exposure to fluoride helps replace the minerals in your enamel that have been removed by oral bacteria and acids throughout the day. Bottled water (sparkling or otherwise) typically does not contain fluoride, so drinking it exclusively can leave your teeth more vulnerable to cavities. Specific flavors of sparkling water can have higher levels of acid than others, such as those with a citrus taste added to them (lemon, orange, grapefruit, etc). It’s still okay to enjoy these varieties, but make sure you do it all in one sitting, ideally during a meal. Sipping on these kinds of drinks throughout the day continually bathes your teeth in acid, which can slowly wear them down over time. Be on the lookout for added sugar! Sparkling water on its own is fine, but many brands will add sugar to improve the taste, which can increase your risk of developing tooth decay just like sodas. Be sure to check the label before you buy. When enjoying a cool glass of sparkling water, you can do so with peace of mind that you’re making a smart choice for your teeth, but keep in mind that plain water is always the healthiest option. This summer, enjoy all the flavors of sparkling water that you like, but once again, watch out for added sugar! With that, you can look forward to a summer filled with bubbles and healthy smiles. Dr. Masha Kogan is a general, restorative, and cosmetic dentist based in Westport, CT with over 20 years of experience. At her practice, she provides a wide variety of dental services and always takes the time to educate her patients so they can take great care of their teeth between appointments. To learn more about which beverages are safest for you and your family’s smiles, she can be contacted through her website.